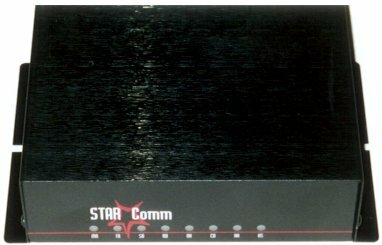 The StarComm cellular security modem is an industrial rated communications device for telemetry and remote management applications. It has been designed to operate on any network utilizing the North American Advanced Mobile Phone Systems (AMPS) standard. Therefore, ubiquitous coverage is available in the United States, Canada and Mexico. With its wide range of AC or DC power options, rugged packaging and industrial temperature ratings, the StarComm cellular security modem offers the ideal solution for implementing remote communications when and where you need it. Compatibility with the North American Advanced Mobile Phone System (AMPS) provides error corrected data rates from 300Bps to 9600Bps throughout the United States, Canada and Mexico. .
RS-232, RS-485 4-wire full duplex and RS-485 2 wire half duplex. One alarm input is provided and may be activated from either contact closure or contact opening. Upon alarm detection, the cellular modem will dial a user defined telephone number and. send a user defined alarm message. As many as 400 passwords may be stored in the cellular modem. Password protection may be configured to operate either with or without a password prompt. Operating without a password prompt makes it more difficult for intruders to understand system operation and access requirements. With the audit trail facilities of the StarComm cellular modem, there is never a question about who has gained access or who has tried to gain access to a remote installation. All attempts to access the cellular modem are stored in a nonvolatile audit trail along with the date and time. The remote configuration facilities of the cellular modem allow the user to remotely maintain passwords, review the audit trail or modify any parameter of the device. Additional configuration commands allow you to select DTE bit rate, character length and parity. Remote configuration access may be restricted to specific passwords. Automates audit trail data collection and simplifies password management for large, distributed networks. DATA COMPATIBILITY - V.32bis, V.32, V.22bis, V.22, V.23, V.21, BELL 212A, BELL 103J. DTE INTERFACE - RS-232E (V.24) and RS-485. Autobaud or fixed data rates to 115.2Kbps. ERROR CORRECTION - V.42 and MNP 2‑4 error correction. MNP 10 extended cellular services. Voltage: Minimum = 8VDC, Nominal = 12 or 24VDC, Maximum = 27VDC. Current (at 12Vdc): Standby = 170mA, Operating Ranges: 420mA to 600mA. Current (at 24Vcc) : Standby = 90mA, Operating Ranges: 230mA to 320mA. Operating temperature range: ‑40C to +85C. Humidity: 95% non‑condensing. FCC Part 15, Class A. Optional: International approvals available. Power: Pluggable terminal strip (Altec STL1550), or equivalent. Antenna: TNC (Amphenol 31‑2389), or equivalent. Alarm: Pluggable terminal strip (Altec STL1550), or equivalent. Network Compatibility: North American Advanced Mobile Phone Systems (AMPS).